Have you heard about the lemurs? Yeah of course but knowing some fun facts about them is really interesting. Actually, fun facts help the children learn about a lot of things about animals. We come up with many fun facts about different animals here it is another addition to our blog. Today we will discuss the ring-tailed lemur monkey facts for kids. Don’t miss it out as the lemurs come with a full package of curiosity. Knowing these fascinating facts about them will also increase your knowledge. The first thing you will notice about this lemur is that they look completely different from other primates in the world. They can be easily identified. So there will be no mistake when you see them. The ring-tailed lemur is also one of the most intelligent among all the primates. Why we call them ring-tailed Lemur? Actually, this ring-tailed lemur got its name from the black rings on their tail. They don’t have any ring all over their body but have ring all over their tails and this makes their name ring-tailed lemur. 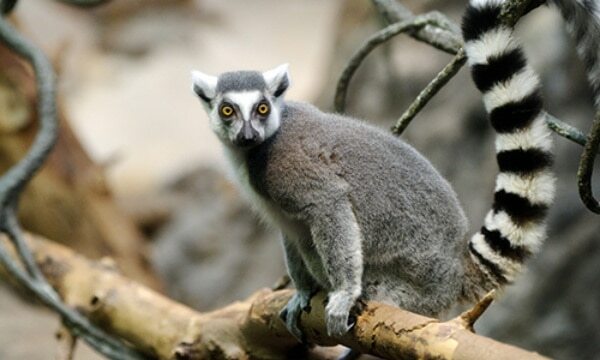 This ring-tailed lemur lives in Madagascar, which is an island on the east coast of Africa. They are mainly found in the rainforest and spend almost all their time on the forest floors. But interestingly, they don’t live in the upper level of the trees, rather they in the mid position or very close to the ground. But they can climb. What they would like to eat? The most favorite food of the ring-tailed lemur is tamarind leaves. But they also eat other fruits and leaves, insects, earth and even spider webs. Actually, the food habit of this lemur is different from the other lemurs. How many Babies does a lemur have? These lemurs have only one baby at a time and in some exceptions, twins are seen. They carry their baby everywhere with them till the baby become matured enough to manage everything on their own. For the first couple of weeks they carry the baby on their front and after that, they will carry the younger ones on their back when the babies are stronger. The females start reproducing from the age of 3 years. What is their body Size? 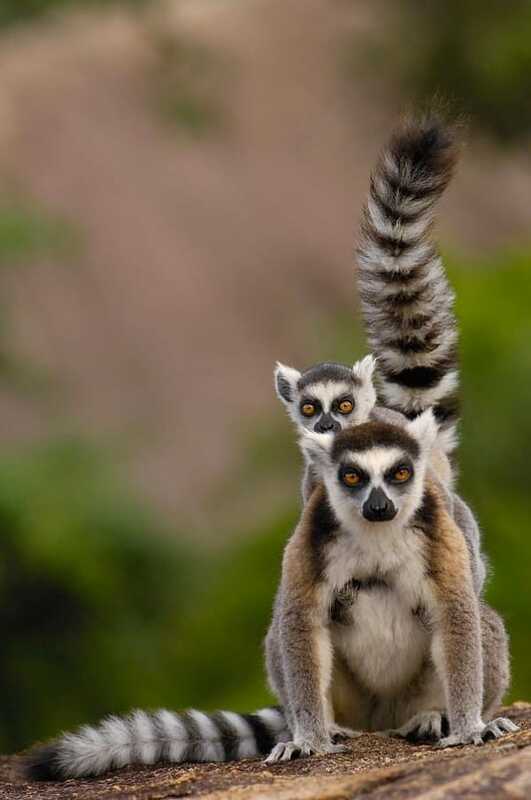 The tail of this lemur is longer than their body and the male and females are almost the same. Their average height is 42.5 cms and weighs about 2.25 kilograms. Normally it is said that they are very social in nature and are seen in troops. As we have said they look completely different from all other lemurs found in Madagascar. The ring-tailed lemur is the official symbol of Madagascar and also used as a symbol for all the endangered animals on the island. The people of Madagascar speaks Malagasy language and in that language, they are called as ‘Maky’. But their Latin name is ‘Catta’ because of their cat-like look. 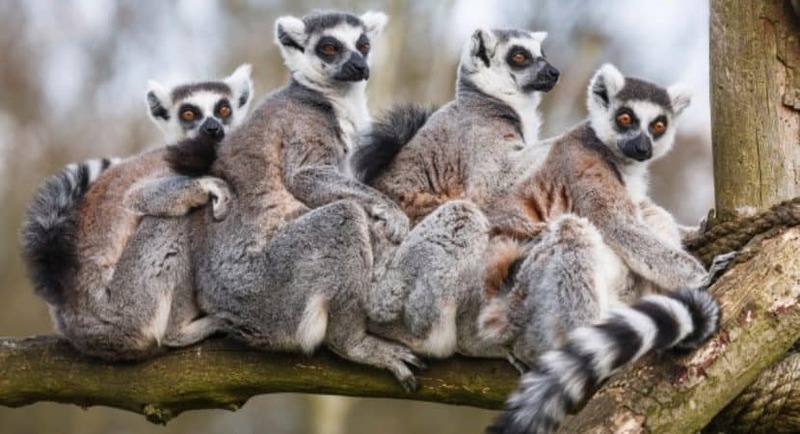 Actually, the ring-tailed lemur is endangered in the wild but as they breed very well in the captivity, they are large in numbers in various zoos. But they face threats like habitat destruction and is hunted by humans for the meat. The illegal pet trade is also another cause that causes a great threat for them. They are sold as exotic pets in lieu of a big amount of money. The WWF also gives the opportunity to adopt a ring-tailed lemur as they are considered endangered by the IUCN. The donations are used for development and management of the park and other protected areas. How long do lemurs live? On an average, the ring-tailed lemur lives up to the age of 15-20 years in the wild. But whenever you keep them in captivity, their lifespan increases up to 30 years which is a great difference. So in every case, they do mostly well in captivity, though nothing is known about this. Ring-tailed lemur monkey is a very interesting animal. Even you should know that they bath in the morning to make their body warm and then sit there putting their arms stretched which is almost like sun worshipping. They are amazing. Do share this article to make people aware of this cute animal and these ring-tailed lemur monkey facts for kids will help them to gather a great knowledge about these endangered animals.